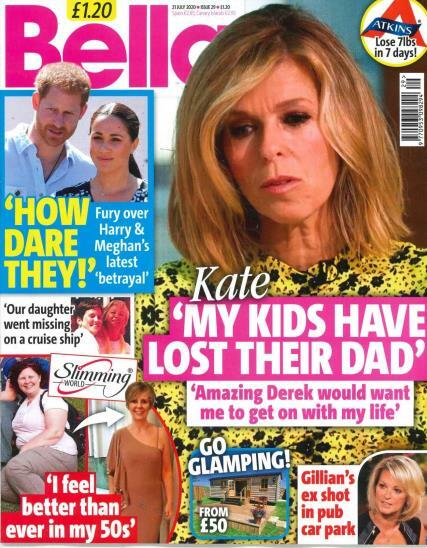 Bella Magazine is a UK women’s publication issued weekly full of information on celebrities, gossip, and dieting, fashion, and news sensations. Buy a single copy or subscription to Bella magazine. The mixture of gossip, sensational news, fashion statements, and celebrity news makes ithe magazine a must have publication. You will find stories in Bella Magazine about new diet sensations, interviews with celebrities, and photos of celebrities, and scandals galore. The magazine has all the latest news on who is divorcing whom and why and whose husband was seen where he should not have been. There are also feature articles on beauty and fashion trends, health news, recipes, and travel information. If you want to read about the lives of celebrities, or human interest stories of survival, health tips, easy to make healthy recipes, and the latest in affordable fashion, you will want to subscribe to Bella Magazine. The weekly magazine, which is just for women, will keep you up to date on all the celebrity news including movie stars, television actors and actresses, politicians and their spouses, all complete with photographs. I bought it for my mother and she LOVES it. It helps her pass the time since my father died and she is all alone. Ordered as a gift for my mother -in-law who greatly enjoys the mag. She has serious health problems at the mo and Bella proves a chance for her to take her mind off them. She loves it. My favourite mag is Bella . There are lots of information on facial and skin care . I am always on the lookout for tips advice on clearer skin and I was so glad when I read about bio oil. i have never looked back . Its got just the right mix of celebrity stories, fashion ideas, beauty reviews and crosswords. I love getting the magazine on a Tuesday and read it from cover to cover. The travel articles are good too as they give me ideas and are suitable for different budgets not just the more expensive end. I love doing the crosswords although sometimes I find it hard to work out the scrambled name at the end. Competitions often have great prizes and I like to have a try at those too. Overall the magazine is value for money and one I would recommend.